I love these beautiful steady strong adjustable chairs they look fabulous with my pub table. Great for any room any occasion easy to assemble. A finely detailed modern bar stool with a diamond pattern back and a sturdy X base. With a high-back chair for extra support and comfort, this bar stool has 360 degree swivel action and adjustable height. Enjoy contemporary design, available in white, grey and brown leatherette with stainless steel brushed metal finish. 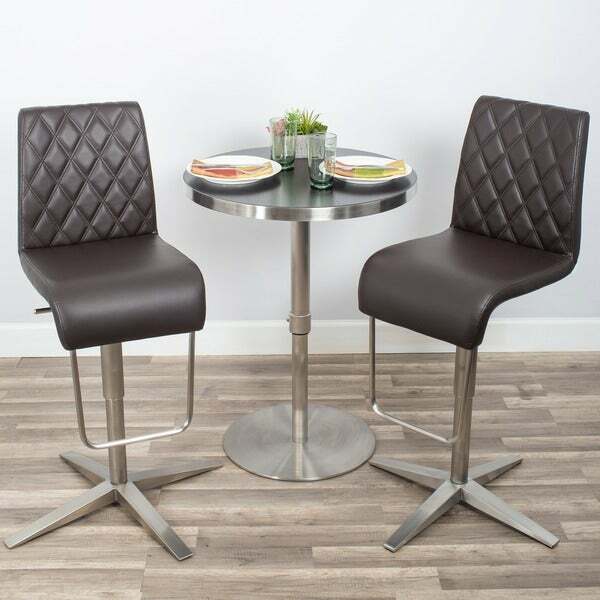 These are very elegant and comfortable bar stools. They were very easy to assembled. They adjust easy up or down. The back of the chair makes it even more comfortable when sitting. Fast &amp; easy to assemble -less than 10 minutes and most of it spent opening the box and moving styrofoam. I was a little worried about the back support since some bar stools can be uncomfortable, but these are great. Got them to match the Triangle Top Pub Table and they do. Very happy with this purchase! Very modern and chic barstools. We got the white with brushed stainless steel. They came well packed. Assembly minimal and very easy. Would definitely recommend. I just want to point out there is the same picture for this item like 3 times for some reason. Anyway, I received 2 grey stools and they look so fantastic in the bar area. My wife and I have a pretty cool theme with greys, whites, and stainless steel furniture. This goes great if you want contrast to a brightly lit room but not too much like black stools. thin and sleek looking stool. I was assuming the cushion was going to be a little too thin but it ends up working out the way it is now. Recommend! I ordered three chairs for our island, with the gray upholstery. The chairs are comfortable, color is perfect, and the brushed stainless steel finish is exactly what I wanted, however one of the chairs arrived with damage. The damage was known prior to shipping, because it was clearly marked with a red sticker, next to the ding on the base. There were also two small tears on the underside of one of the chairs, where metal from one of the other chairs was pressing into it during shipping, either to me or on one of it's other journeys. I totally recommend this stool! Just changed my old chrome small barstools for this amazing style. I had a set of stools that the base was small that looked like one of those old small vinyl records. This stool on the other hand is very sturdy and the base is much bigger and heavier than my previous stool. I totally recommend this stool! I do not normally do reviews, but I had to write one about this one. It is just too great of a stool and I love the fact that the footrest is attached to the seat itself and not the pole. The square base is not to distracting like the lifted disc looking type bases and it is very stable. Very recommended for those who like sleek stools that stand out from the rest of the market. Thanks! First time I bought my furniture on line and I am glad I did. I bought 4 grey stools they look durable and beautiful in my kitchen. I already have many comments on them. LOVE IT!!! Makes the bar look even better! We bought 4 they came in excellent condition. They also look beautiful and very easy to assemble. Good for the price. Grey is pretty. Doesn’t look vinyl but certainly doesn’t look high quality leather either. Easy to assemble. One of them slides down if too much weight in it. I wish I would have spent more money and got something I loved. These chairs are beautiful and comfortable. I purchased 3. Within the first year the faux leather on all 3 has started peeling and wearing. They look terrible. I’m very disappointed in the quality. Very happy with my purchase. Thank you Overstock. 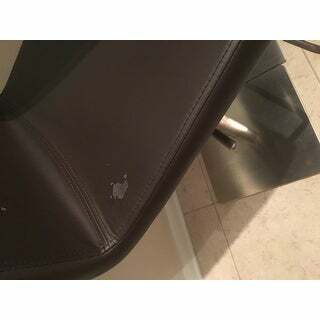 The leather/vinyl seat started to peel two weeks after purchase on both chairs. What a disappointment...looks great but bad quality. Color and modern style was perfect for my decor; however, the angle of the seat to the back is too acute so that you would slide out of the chair when seated. I had to modify the chair by raising the front of the seat with 1/2 " washers and longer screws so that the backrest tilts further back and the chair seat up. Just didn't feel like shipping it back and shopping for something else. So far the jury-rig is working well. Would not recommend this product. "What is the maximum weight of this product?" The maximum weight recommended for this product is 220 lbs. "Is the x base of seat really 25 inches as ths doesn't seem right? " The base is exactly 25.5 inches in diameter. "Is the x base really 25 inches wide ? It doesn't seem right "
"What is the max weight for an adult for this product?" "need to know if these would work for a 24" height thats what Im looking for"
The seat height is adjustable between the 21 inches and 31 inches.